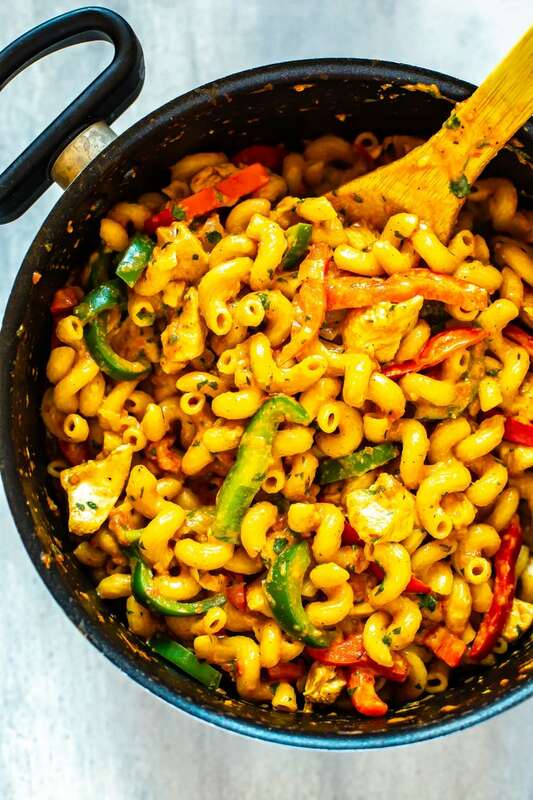 This One Pot Cajun Chicken Pasta is SO easy and is ready in 30 minutes! 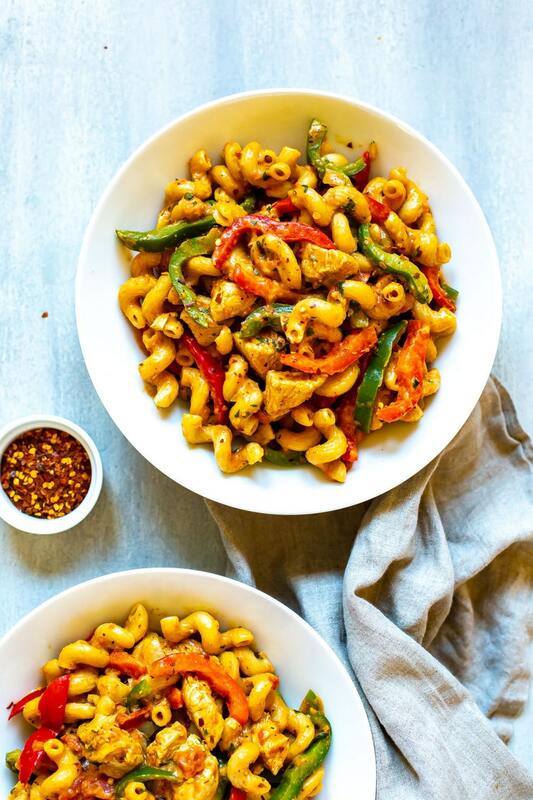 It's the perfect last-minute dinner idea, with juicy chicken breast, bell peppers, and pasta in a spicy, creamy sauce! 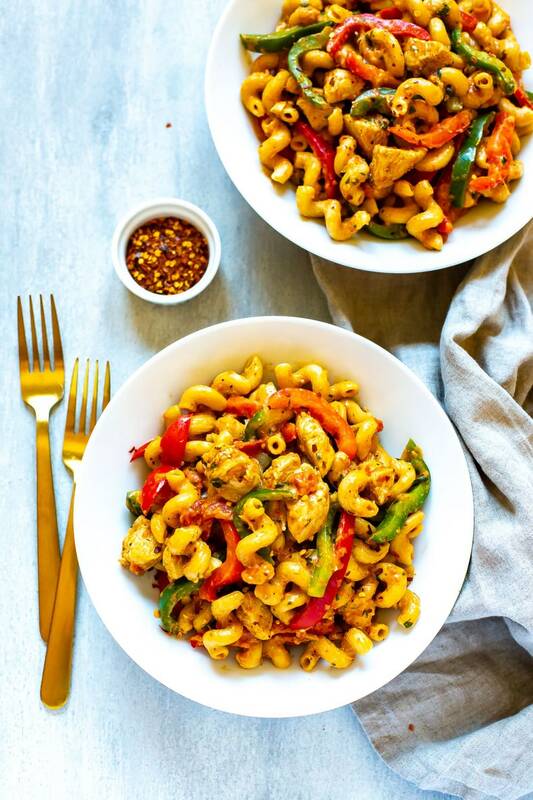 Chili's Cajun Chicken Pasta made healthy! Chili’s may be responsible for making creamy Cajun chicken pasta famous but this homemade version tastes so much better! 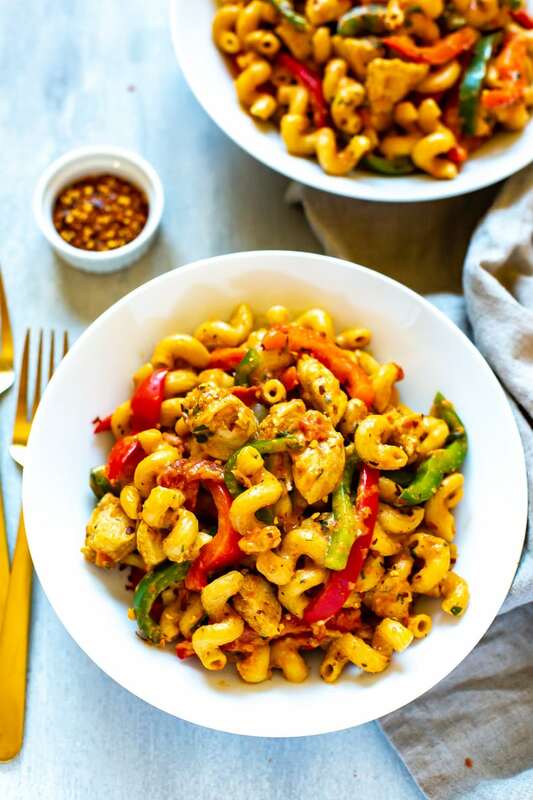 The traditional Cajun chicken pasta by Chili's is made with a ton of heavy cream and butter, and the calorie count is out of this world, as is the case with most restaurant pasta dishes. I mean, the real thing tastes pretty amazing but a small plate totals MORE calories than most women's total daily allowance, which is CRAZY! Seriously, check it out for yourself and a small serving totals 2640 calories, while a large clocks in at 4990 calories. 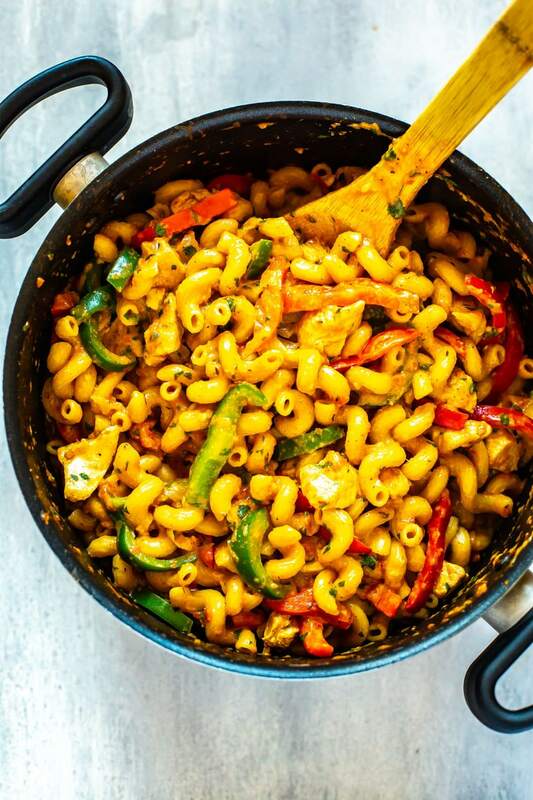 Well, with my healthier version of Chili's Cajun Chicken Pasta, you're looking at just 420 calories per serving if you divide the total pot of pasta into 6 servings. 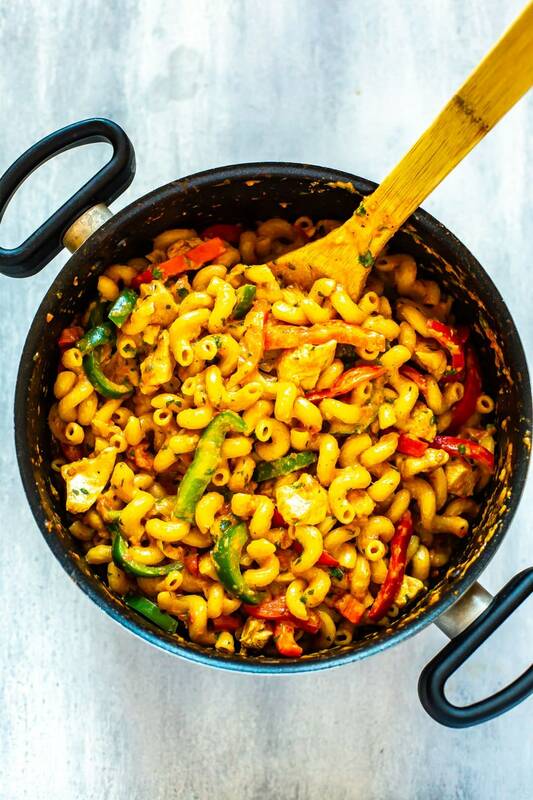 Each of your meals should be between 300-500 calories so this comes in right on point and is a much healthier alternative to the traditional pasta – and you only have to use 2 tbsp of heavy cream to get the same creaminess without all the calories! If chicken recipes are my jam, then I think pasta dishes must be the toast. Take a quick peek at my recipe index, and you'll see a lot of other one pot pasta recipes. One pot pastas are great because you just have to dump everything into the one pot, usually starting by sauteeing meat and veggies then adding in dry pasta and liquids. Let everything cook for 15 minutes or so until the liquid is absorbed and you're ready to garnish and serve! It's that easy! You could just cook the noodles separately but I find they absorb all the flavour of the broth and diced tomatoes this way if you let them cook with all the other ingredients. This leads to much richer flavour without any extra butter or cream. The ingredient list for this pasta recipe is relatively short and makes for the easiest weeknight dinner! As long as you have some chicken bouillon cubes and a can of diced tomatoes kicking around in your pantry along with a well-stocked spice drawer, you're halfway there! When the descendants of French settlers moved into Louisiana, they brought their spicy Cajun cuisine with them. For this Cajun chicken pasta recipe, I used a pre-made seasoning blend to keep things simple and easy – you can usually find Cajun spice in the spices aisle of your local grocery store. This way you can keep your prep time down and have more on hand for the next time you make this Cajun chicken pasta! But if you enjoy making your own spice blends or are looking to control the sodium levels, there are plenty of Cajun seasoning recipes floating around the Internet (this Cajun spice recipe is super easy and you should have all the ingredients on hand already). 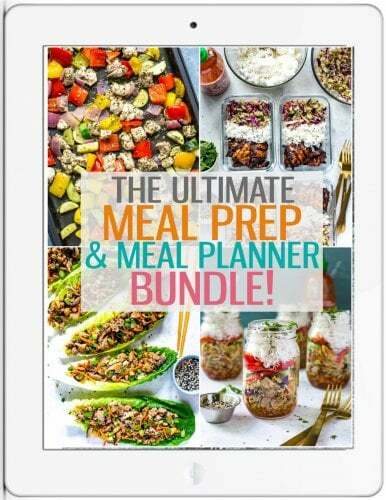 Or you can just put together equal amounts of the spices I listed above for a quick version! 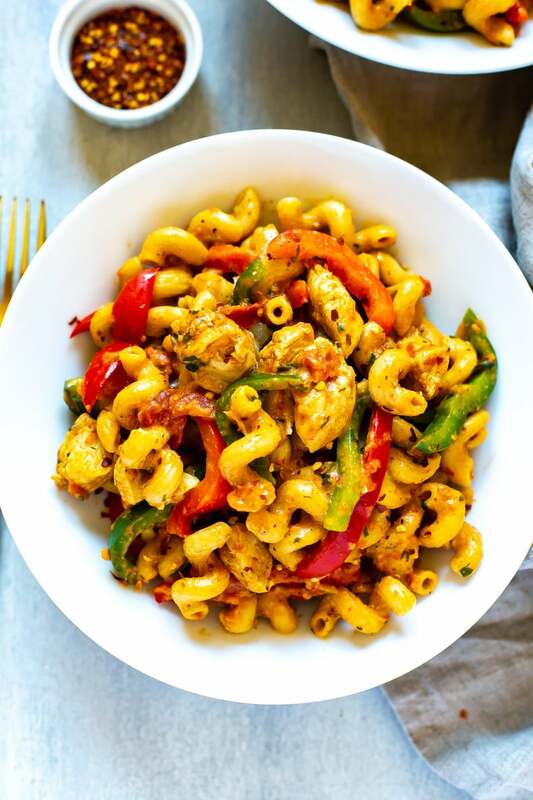 This Cajun chicken pasta recipe is SUPER easy to make, and comes together in about 30-45 minutes so it's great to make after a busy day of work, and even works amazingly well for weekly meal prep considering how well it reheats. To make it, you'll first saute the chicken, onions and garlic in a little bit of olive oil, then add your Cajun seasoning. You're just going to saute over medium-high heat quickly because you don't want the chicken to overcook; it's going to cook more once you add in the pasta and liquid so keep this to just two or three minutes. Stir in your diced tomatoes, dry pasta and chicken broth, making sure the pasta is submerged as much as possible underneath all the liquid so it can absorb it. Depending on the pasta used, it should take about 15 minutes to absorb most of the liquid, then you'll stir in the heavy cream and bell peppers. I save the bell peppers til last because I HATE soggy vegetables. They really only take a couple minutes to become tender and then they continue to cook as they sit in the hot pasta. What can I substitute for heavy cream? To make rich cream sauces like the one in this Cajun chicken pasta recipe, you'll want to use heavy cream. High-fat comfort foods like this don't come in a “light” version very often. Without a doubt, Chili's Cajun Chicken Pasta is packed with fat. But, almost always, the occasional splurge is worth the extra fat and calories and this is controlled here by adding only TWO tablespoons of cream. It makes the sauce nice and creamy without adding a ton of calories – in fact, two tablespoons of cream is only 50 calories. Divide this by 6 servings and you'll hardly notice an impact to your waistline. If you really want to lighten up the sauce more though, you can substitute whole or 2% milk for the heavy cream. Oh, and if you happen to be out of heavy cream, you can make your own. Just combine a few tablespoons of melted butter with a cup of whole milk. Heat them up in a saucepan to melt the butter. Easy, right?! Like many other pasta recipes, this Cajun chicken pasta can be frozen and reheated beautifully! Just freeze in some small glass bowls (I use little round ones like these), and then defrost in the microwave for 6-7 minutes, stirring halfway through. Before reheating make sure to splash 1-2 tbsp of water on top. I do this whether I'm reheating from frozen or from the fridge – it's the key to reviving pasta correctly and you don't get that sticky, dry texture as you would if you reheated without water. That's my secret to reheating pasta or just about any type of leftovers – try it for yourself and once you taste the difference you'll be thanking me for years!!! Can I use a different type of pasta? Creamy sauces tend to cling best to kinds of pasta that have ridges, which is why I use cavatappi. Cavatappi is corkscrew macaroni, also known as Scoobi Doo in some parts of North America. If you want to use a different type, just be sure that it is similar in size – penne with ridges is usually fine, and rotini works as well. If you choose smaller pasta like little shells or macaroni, it may overcook. Mushy pasta is not a tasty option, so choose your pasta accordingly! When you cook pasta in a skillet, as you'll do with one pot Cajun chicken pasta, it needs liquid to help it cook. I use chicken broth for this purpose. If you find that your pasta isn’t cooking, you can add a bit more broth. Don’t add too much at once, though; maybe 1/4 cup or so to start. 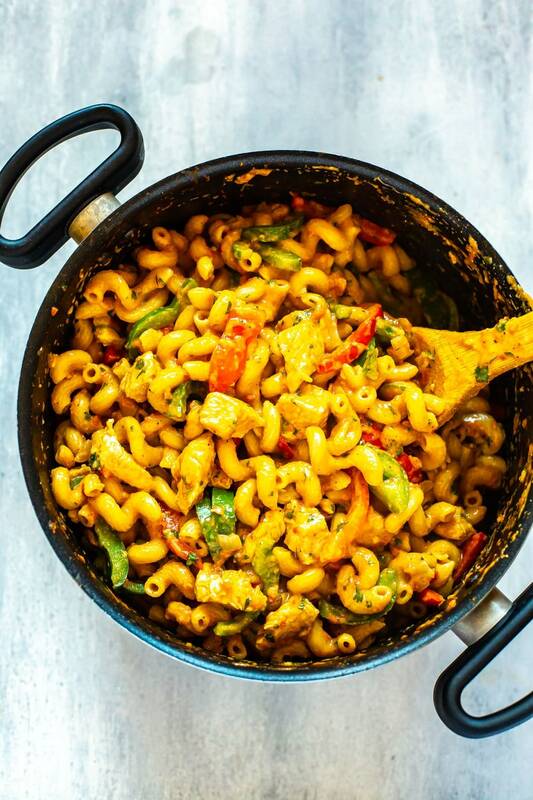 Just like most pasta dishes with meat and vegetables, one pot Cajun chicken pasta can be a complete meal in itself. But a garden or vegetable side salad is a nice option. Or, since we're already going full-on comfort food, maybe serve some warm dinner rolls with butter. Now what are you waiting for?! Cook this one pot pasta up already!!! 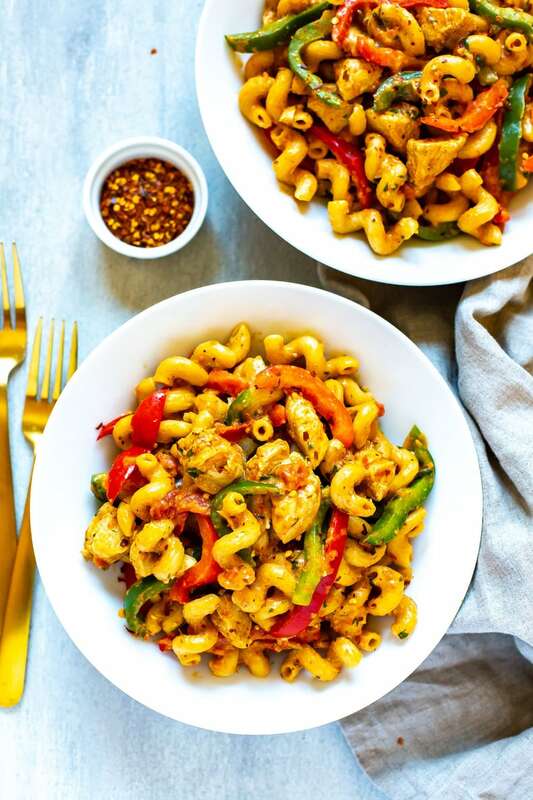 Grab some glass meal prep bowls if you plan on turning this Cajun Chicken Pasta into your weekly lunches, or if you'd like to freeze it for later! Preheat olive oil in a large pot over med-high heat. Add chicken and saute for 2 min until lightly cooked. Add in onion, garlic, Cajun seasoning and salt and pepper, sauteeing for 2-3 minutes until tender. Stir in diced tomatoes and pasta, then add chicken broth. Bring to a boil then cover with lid and let cook for 10-12 minutes until pasta is al dente and has absorbed most of the liquid. Remove lid and stir in bell peppers and heavy cream, cooking another 2 minutes until peppers are tender. Remove from heat, stir in cilantro, then serve and enjoy! 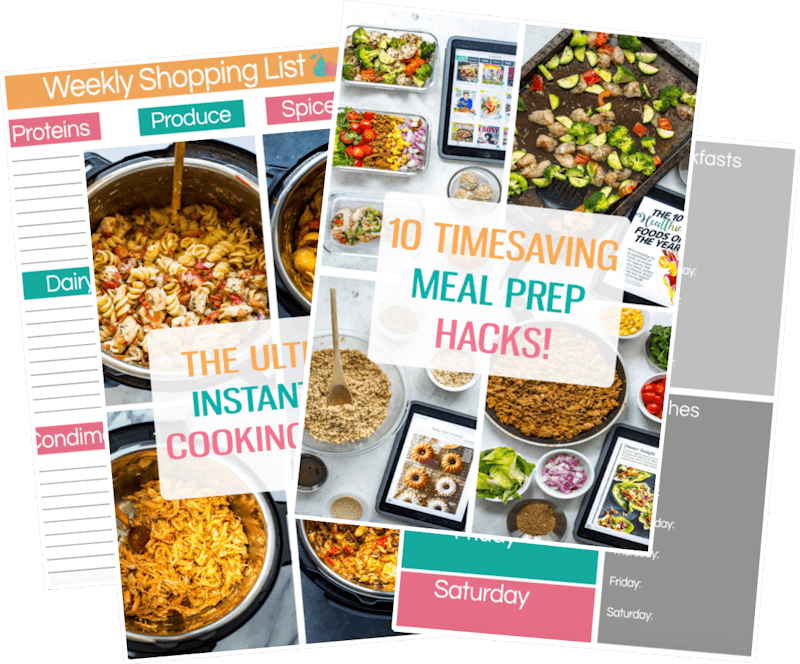 Have you tried to adapt this recipe for the Instant Pot? You could easily do this one in the Instant Pot too 🙂 Just dump all ingredients in the Instant Pot in order that they are listed, leaving out the peppers, cream and cilantro. Cook on high for 3 min, then do a quick release of the pressure. Stir in bell peppers, cream and cilantro and cover with lid, letting sit for 5-10 min. Should work out perfectly!